Were it not that this book was by Isaac Asimov, and was the first non-fiction book on which he worked, it would have died a well-deserved death long since. Actually, it isn’t that bad. 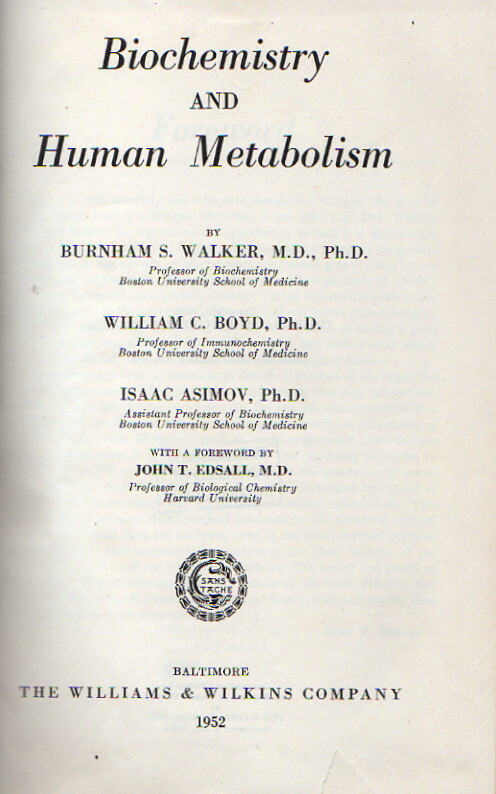 If you happen to be a medical student of the early 1950’s or a student of Asimov and his writing, it isn’t bad at all. Asimov’s own estimation of the book is badly colored by his unpleasant experience in writing it. It is, barring the outdated science and the turgid writing style forced upon Asimov by the book’s genre, actually OK. Beyond that, there is little to say. It has very little, if any merit, beyond its being the first non-fiction book with whose writing Asimov had a part. Its science is badly out of date (PNA, anybody? ), and since Asimov is only responsible for one-third the writing (at best), it is less than thrilling as an example of the Good Doctor’s skill at handling non-fiction. It is rather fun to try to guess what part are Asimov’s and which aren’t, but, beyond that—there’s virtually nothing to recommend it to today’s audiences.